It is my great privilege to work one afternoon a week at Vallejo Chiropractic in Vallejo doing an innovative new collaborative type of work combining the best of what I know with Activator Chiropractic work. the Doctors at Vallejo Chiropractic and I work hand in hand in half hour and hour sessions to get to the heart of the most difficult problems that our clients can bring to the table. This is deep, sometimes emotional work aimed at helping with issues that have not responded to other treatments. 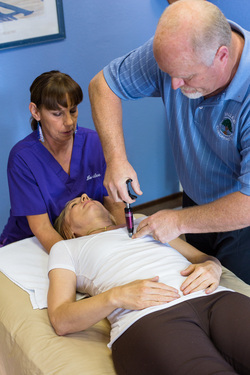 Combining CranioSacral Therapy and Chiropractic we have been able to help people with issues ranging from Head traumas and strokes, to chronic and acute extremity problems, scar tissue causing pain or dysfunction or to any kind of injury/illness that has not responded to other approaches. If you are interested in experiencing this work first hand, please contact Vallejo Chiropractic at the number below and schedule a MultiHands session.